"These are great to make ahead of time and then freeze. We freeze them with mashed potatoes and corn as part of a homemade TV dinner." In a large bowl, combine the ground beef, rice, 1/2 cup of water and onion. Blend in salt, celery salt, garlic powder and pepper. Mix well. Shape into 1 1/2 inch balls. Preheat oven to 350 degrees F (175 degrees C). In a large skillet over medium heat, brown the meatballs; drain fat. In an 11x7 inch baking dish, combine the tomato sauce and 1 cup of water. 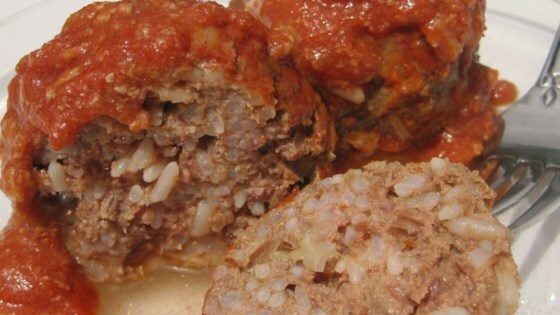 Place the browned meatballs into the tomato sauce, turning to coat well. Cover and bake in a preheated oven for 45 minutes. Uncover, and cook for an additional 15 minutes.